America probably experienced ‘peak water’ in the 1970’s (Arstechnica). More than 1.2 billion people lack access to clean drinking water (UN). More recently, a majority of the world’s important groundwater reserves known as ‘fossil water’ have been overused and recent drought and local climate changes have depleted them further. Many are backup water sources for when the rains fail, only now these are failing as well. US Intelligence reports indicate this could cause conflicts and failed states (Guardian 2014). Israel have also built more desalination plants per capita than any other country on earth. Over half their population get their drinking water from desalination plants. Israel built 5 plants in the last 10 years to achieve this. While energy intensive, it only accounts for 3% of Israel’s annual electricity use to get 50% of their drinking water from the Mediterranean ocean. They have gone from water poor to water wealthy, and could soon be exporting water. Israel are the world’s largest recycler of grey and black water for agricultural use, with local rural townships supply cleaned up waste water for local agricultural products in what would otherwise be desert. Their drip irrigation method saves 40% of the water usually used, and yet gets 50% better crop yields. Qualification: Israel’s strategy appears to rely on high density populated townships in the deserts to efficiently recycle their grey and blackwater, focussing that cleaned up water into local agricultural projects as appropriate. I doubt this strategy would work over much larger areas, like moving waste water from Africa’s cities to the Sahara (a long distance indeed) or from China’s cities all the way up to China’s growing Gobi desert. Other more energy efficient, local and natural strategies are required for such vast areas. The video above also mentions farming fish from salty underground desert water, and then feeding that salty, fish-waste water to salt-tolerant plants that love all the extra waste nutrients. Then there’s the Tal-Ya water box, a dew-catching tray that pulls the dew directly out of the air and funnels it to the plant. It can be used alone in some areas, or for dryer locations be used in conjunction with drip irrigation as well for maximum efficiency. The Dutch also invented something similar with the Groasis Waterboxx designed specifically to establish trees in areas undergoing desertification. It collects dew and infrequent rain, and slowly releases it to the plants roots, promoting deeper root growth. The wiki has an interesting list of advantages and disadvantages. One that strikes me is the sheer economics of setting up drip irrigation must mean that in a desert country, paying for plastic piping infrastructure must be cheaper than paying for the extra water a cheap giant surface farm sprinkler could distribute. Water application efficiency is high if managed correctly. Field levelling is not necessary. Fields with irregular shapes are easily accommodated. Foliage remains dry, reducing the risk of disease. Initial cost can be more than overhead systems. If the water is not properly filtered and the equipment not properly maintained, it can result in clogging or bioclogging. 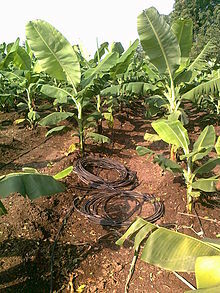 Drip irrigation might be unsatisfactory if herbicides or top dressed fertilizers need sprinkler irrigation for activation. Drip tape causes extra cleanup costs after harvest. Users need to plan for drip tape winding, disposal, recycling or reuse. In lighter soils subsurface drip may be unable to wet the soil surface for germination. Requires careful consideration of the installation depth. Most drip systems are designed for high efficiency, meaning little or no leaching fraction. Without sufficient leaching, salts applied with the irrigation water may build up in the root zone, usually at the edge of the wetting pattern. On the other hand, drip irrigation avoids the high capillary potential of traditional surface-applied irrigation, which can draw salt deposits up from deposits below. The PVC pipes often suffer from rodent damage, requiring replacement of the entire tube and increasing expenses. Anywhere you have desert next to the oceans, you can turn seawater into food and freshwater and a local green oasis. But this is such a big topic I devoted a whole RULE to it, see 8. REGREEN DESERTS.